Whale and dolphin watching, snorkeling and a visit to natural water caves! During this combination tour we’ll embark on a search for humpback whales to listen to their love songs and feel the great sensation of watching a mammal that weighs more than 40 tons jump out of the water and splash its gigantic tail. 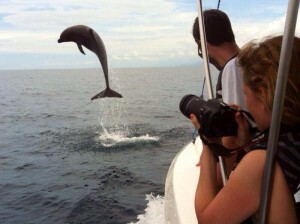 Snorkel and observe bottled nose dolphins, spotted dolphins, turtles, bi-color parrot fish and more in Uvita, Costa Rica. One of the best places for whale watching in the world! Eco-tourists and wildlife enthusiasts will be blown away in our exhilarating Whale watching and Dolphin encounter Costa Rica Combo tour. The Marino Ballena National Park is home to one of the most biologically diverse marine habitats in Costa Rica. From observing large pods of bottle nose , spotted, common or spinner dolphins performing acrobatics to witnessing a Humpback Whale teach its baby to breach, this tour is for everyone to enjoy! Snorkel Isla Ballena – Whale Island and Punta Uvita “Whale tail” to explore the marine life of Marino Ballena National Park! Later, visit to the gigantic natural sea caves of Playa Ventanas as your captain carefully approach to the caves, giving you an awesome perspective of this wonderful place of Uvita Bahia Ballena. Come join us on the most FAMOUS Bahia Aventuras Costa Rica boat tour & best whale watching in Costa Rica , where you can combine your five senses to create a powerful experience connecting you with nature! The Bahia Aventuras Combo Tour is the best option to see the most of the Marino Ballena National Park. The Boat departs fro m Punta Uvita Beach and visits the famous Punta Uvita Whale’s Tail, Ballena Island, Tres Hermanas Islets and Ventana Sea Caves. During the tour we search for *Humpback Whales (sea seasons information below) and two different species of resident *Dolphins. 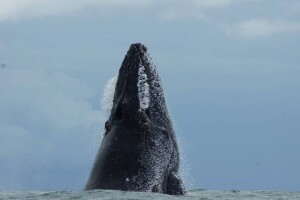 When granted the opportunity you might see and hear the song of the Humpback Whales and or observe the acrobatic displays of the dolphins making this trip the best Whale watching tour of Costa Rica. Others species that are seeing occasionally during this are : Bryde’s Whales , Pilot whales, False Killer whales and other marine life. We also visit the coral and rock reefs to *snorkel and observe the wonderful marine wildlife of the Ballena Marine Park. While cruising in the boat you can enjoy the scenic beauty of the coastline of Costa Ballena and observe the diversity of shore and pelagic birds nesting and roosting in the Islets of the park. During the trip our captain will take you to the caverns of Ventanas Beach where you can observe wonderful rocky formations and an amazing caverns that were carve by the ocean and tectonic movements during thousands of years . This tour is very popular in Bahia Ballena and highly recommended for all the family visiting this side of the Osa peninsula , Costa Rica. Click here to check availability and book ! Please contact us for more information about tour details and availability. Click here to inquiry & book Now! Suitable for children over 3 years of age – Not recommended for infants.